Looking for the best repellent to control a gopher problem? What kind of repellents are available. How to choose a repellent. How to use a repellent. What kinds of results you can expect. If you want to reliably get rid of gophers, repellent s can be a big help. 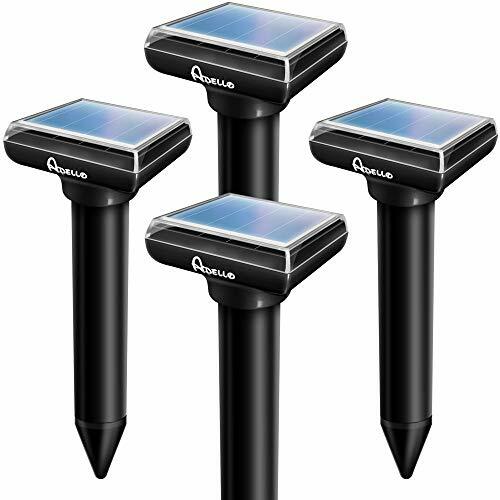 Of all the gopher repellents we surveyed, we liked the Apello Solar Powered Repeller the best. It has a good track record of successfully driving gophers away, and keeping them away. In simpler terms, we like it because it works. There's a lot of knockoffs floating around the internet, but this one appears to be giving solid results for homeowners with gopher problems. It gives you an audible signal to let you know it's working, which is good for your peace of mind. It's waterproof against rain and sprinklers so you don't have to worry about it. It has excellent coverage, and the solar panel on top keeps the batteries charged for around-the-clock operation for up to 4 days during bad weather. 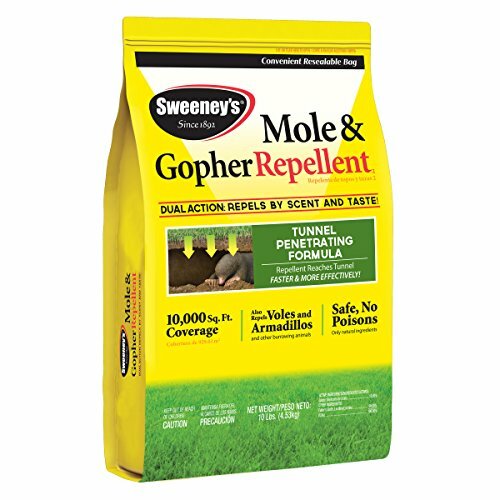 Like with any electronic repeller, you might find that they don't work for your gopher problem in which case, we'd recommend trying something like Sweeny's Repellent Granules. These are more to disturb a gopher via their sense of smell rather than hearing. What gopher repellents are available? Do sonic repellents actually work for gophers? Do chemical repellents actually work? What should you look for in a gopher repellent? How should you choose a gopher repellent? What is the best way to use gopher repellents? What results should you expect from gopher repellents? Check out our below list for a summary of our results. Keep on reading to learn more about repellents and gophers! Generally speaking, there are only two kinds of repellents available: sonic repellents and chemical repellents. Both types have mixed track records. Let's look at them individually. Sometimes they do but there's no concurring research to prove it one way or the other. Anecdotal evidence from satisfied customers supports the theory that they function as advertised. And to be perfectly frank, there are also a number of customers who claim it worked at first, then after a while, it stopped working. Early sonic repellents used continuous noise to drive away rodents such as gophers and moles. But the animals soon adapted to the noise then finally ignored it. Modern repellents use a different approach by emitting noise at regular intervals. Hospital studies have shown that intermittent noises are more annoying than continuous ones, so there is some support for this newer methodology. Anecdotal evidence on the effectiveness of these newer sonic repellers has increased substantially, so this approach appears to hold up in practice as well as in theory. Read Also: What are the best ultrasonic repellers for most pests? Once again, the answer seems to depend on who you ask. While it's true that there is very little research to support the long-term effectiveness of chemical repellents, the amount of anecdotal evidence in their favor is rather impressive. After all, it's hard to argue with a yard that's suddenly free of gophers after putting out a chemical repellent. Curious what a gopher looks like digging a hole? Check out the below video. The first thing to look for is the anecdotal evidence, i.e., the track record. Does it have a history of success or failure? People like to talk, and they especially like to talk (complain) about products that don't work. Regardless of the eggheads in their ivory towers, this is a pretty good indication of a product's utility. The ease of use is a biggie. No one wants a gopher repellent that's a pain in the neck to use. Products that are difficult to use wind up sitting in your garage or shop gathering dust. Finally, you should look for a repellent that doesn't have to be constantly re-applied. If it takes more than one or two applications, you're probably looking at a product that isn't going to work. Read Also: What's the top bait for gopher removal? Since most scientific studies don't support the idea of gopher repellents, you'll need to turn to people like us who've done the individual research for you. We've looked at the available offerings and compared them for effectiveness, then tabulated the results for you to use. After 14-and-a-half years in the field as a Pest Control Technician, I've developed a pretty good nose for what works and what doesn't. Nothing is 100% of course, but within their limitations, these gopher repellents are very decent. I like them. Sonic repellents broadcast sound – usually around 400 Hz – in a circular area 40-50 feet in diameter. They do so at intervals of 25-30 seconds. The best way to use them is to set them up so their coverage areas overlap each other. Also, make sure they're not on the same timing. You want them set up so one goes off, then the other, then another, and so on. But don't do it 1,2,3,4 down the line. Stagger them, so the first one sounds on one part of the yard, then the next one sounds on the other side of the yard and so on. The intermittent sound, coming randomly from different directions will be the most annoying to the gophers and have the best chance of driving them away. Chemical repellents, usually granules, work by being broadcast over the area you're trying to protect. In addition to spreading them over the area as a whole, pour a small amount down each opening in the mounds. Most granules are water activated, so water the affected area as soon as you've put them out. Read Also: What are the best traps for gophers? Surprisingly, sonic repellents will actually increase gopher activity in the area when they're first turned on. This is because of simple curiosity. The animals hear something new and want to investigate it to find out what it is. Then, as the noise continues, it becomes annoying and irritating. When they're unable to make it stop, they begin to leave. You should probably give it about a week to drive the gophers (and moles, etc.) out of the area. To keep them out long-term, vary the pattern and timing of the sounds occasionally. Turn all the repellents off, then turn them back on again in a different order. Chemical repellents should begin working within a day or two. You'll have to keep a closer eye on them though and reapply them after a heavy rain. Regular pesticides biodegrade and have to be reapplied on a regular basis, and so do these gopher repellents. It's the nature of the beast. To recap briefly, there are the 4 gopher repellents we reviewed. As long as you follow the directions, all of these will work to one degree or another. These brand-new sonic repellers from Apello are easy to set up. You just connect the two cables inside the aluminum bar to the inserts on the top section. Connect the bar and the top, then insert it into the ground. The solar panel keeps the batteries charged for unending operation 24-hours a day. The green, “garden” colored head blends in well with your landscaping. These have fairly good coverage, up to 45-feet each. Use overlapping fields by placing the spikes 80-feet apart or less. The 400 Hz low-frequency sonic pulses take place every 25 seconds to keep gophers, moles, and other rodents out of your yard, garden, and pasture. It doesn't have any audible signal to let you know it's still working. After the initial burst of curiosity-driven activity, the critters will begin leaving so your yard, etc., can recover. However, these are weather resistant rather than waterproof. Installation is fast and simple. If you're in an area that receives a lot of rain it's nice to know these are waterproof. The solar panels on top recharge the batteries for continuous operation night and day. It doesn't have an audible signal like our top pick, but that's our only complaint. When these spikes are first installed they actually attract gophers, out of simple curiosity, before it drives them away from the constant bursts of painful noise. Don't give up, wait through the initial increase in activity and it will begin keeping them away. This has a good coverage area of approximately 7,000 sq. ft (650m²) each. To maximize the spread of the sonic and vibration, you should install them every 50 feet (15 meters) or so. Stagger the timing so they're going off at different times. Irregular and alternating 400-1000 Hz low-frequency sonic blasts will confuse, frustrate, and irritate the gophers and moles, driving them away. 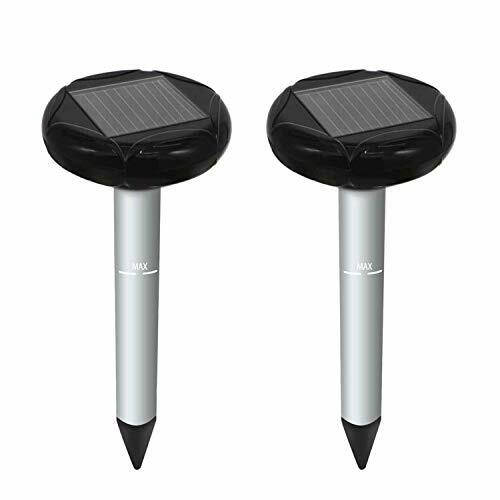 These solar-powered spikes have two solar panels, slanted to catch the morning sun and the afternoon sun, a handy little feature that makes placing them extremely easy. The panels recharge the batteries for continuous operation for up to 5 days during inclement weather. 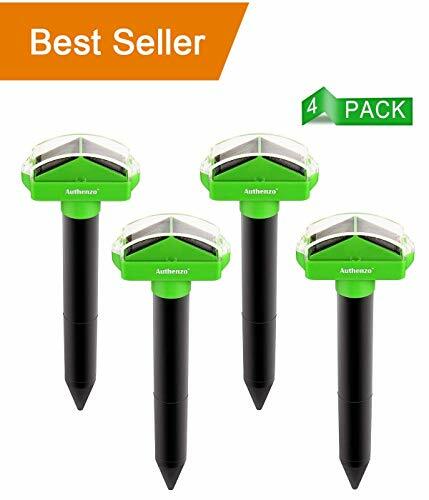 These repellers are big, made of sturdy, waterproof plastic. The on/off button creates a shaking motion when it actives, letting you know it's working. The 400 Hz low-frequency is generated deep in the spike where it's underground and covers just over 7,000 square feet per spike. Place them 82-feet apart or less for complete coverage. The head is a “garden” green that blends in well with your landscaping. Comes in a bigger pack than most other products. The assembly instructions need a bit of updating though. The head comes off to make it easier to connect the wires then probing around inside the tubing of the spike. This is a bag of fine granules that can be easily broadcast with a spreader or one kind or another. Although the instructions on the bag claim it will cover 10,000 square feet, that's a little thin in our view. 5,000 square feet is probably better. Spread the granules then water the area to activate them. Give it a few days and most people see a difference as gophers come up, smell the odor, and decide they don't like it. Once they vacate their mounds – after several days of no visible activity – you can pour some granules down into the mounds then run the hose into it for a few moments. The smell seems to penetrate the soil very effectively, keeping the gophers away even if they don't come out of their burrows to encounter the granules. There's no smell to us humans, and it's completely safe for your pets and children. You'll probably need to replenish every 1-2 months, depending on how much rain you get. Water activates it, but too much will wash it away. There are a lot of gopher repellents on the market and we were surprised the sonic ones ranked so high. Overall, our pick goes to Apello. It's got an excellent track record of success, it's easy to assemble, and install. The long-term results seem to be well worth it. If you want to try an alternative approach targeting a gopher's sense of smell rather than their hearing, we recommend checking out Sweeney's Repellent Granules as well.